Ask a New Yorker, and he’ll tell you that Albany is the state capital, a city of immigrants best known for its pubs and politics. Head west, and you might get a different answer. Nearly half the states that make up the USA lay claim to a place they call “Albany,” and more are found navigating the globe from Albany, Nova Scotia to Albany Island on the Cape York Peninsula of Queensland, Australia. I’m not alone in thinking of Albany, NY first. As the longest continuously chartered city in the United States, Albany, NY spawned many namesakes—at least ten cities claim to have been named in honor of Albany, NY. But it wasn’t the first “Albany.” Origins of the name can be traced to the Gaelic “Alba” for Scotland or its Latin form, Albania or Albion, referring to Britain as a whole. The root word refers to “white;’ in Spanish, “alba” means dawn. And in the medieval music of the troubadours, the term referred to a song of lament for lovers parting at daybreak. If that’s the case, what could be learned from visiting all the places named Albany? Dubbed “Smallbany” despite a population of nearly 100,000 in the city proper–augmented by the nearby cities of Troy, Schenectady, and Saratoga Springs which collectively make up the Capital District—Albany, NY oftentimes feels more like a small town than the fourth-largest urban area in New York State. Children enjoy all the perks (and pitfalls) of middle America sprawl—booming multiplex theaters, Chuck E. Cheeses, and an assortment of FroYo lookalikes—as well as the bygone charms of drive-in movie theaters, outdoor ice rinks, and sugar shacks. Change comes slow to this Albany, but maybe that’s a good thing when it means that you can still find the kind of low-key family fun rarely seen outside a Norman Rockwell print. 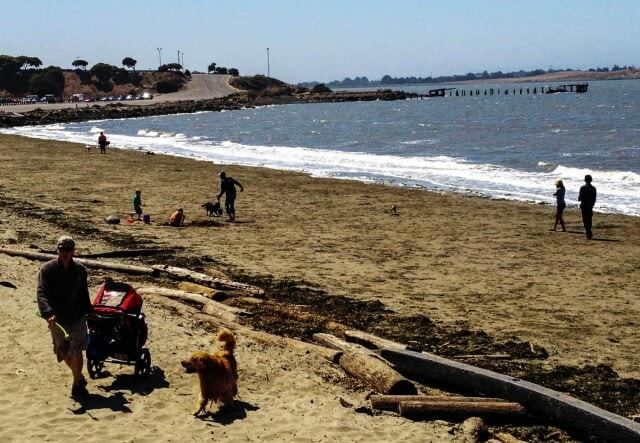 There’s not much land in Albany, CA—the entire city covers a total of 5.5 square miles, much of it facing the eastern shore of San Francisco Bay where it borders Berkeley, CA. As the story goes, the city got its start in 1908 when a group of women, armed with two shotguns and a rifle, protested the dumping of Berkeley garbage in their community. A little more than a hundred years later, this Albany gives access to the 8.5 mile shoreland parkland of McLaughlin Eastshore State Park, “one of the most outstanding achievements in the history of open space protection” where natural features such as tidal marshes and beaches blend with reimagined landfills. Entering the park at Buchanan Street in Albany, we found a dog-friendly beach and shoreline trail that leads past outdoor sculptures that literally transform trash to treasure. As of summer of 2012, there were no restrooms and garbage collection seemed a little spotty, but a million-dollar renovation plan is in the works. There are some good-hearted folks in Albany, OR. Located just a little over an hour’s drive south from Portland, this Albany was a good place to stop for lunch on our drive to San Francisco as the downtown center boasts museums, restaurants, easy parking, and sidewalks made for walking. 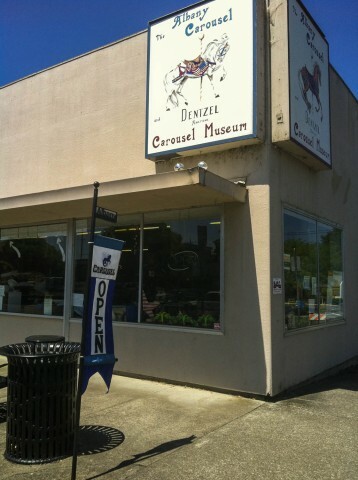 We began our stroll at the Historic Carousel & Museum, a grassroots project where volunteers are working on building a carousel featuring fanciful hand carved animals, each with a unique story and sponsor. I just peeked in, but visitors are invited to watch the carvers and painters at work and to learn about the historic Dentzel mechanism that will drive the carousel. I was alone with my son—having dropped off my daughter at ski camp in Mount Hood—so we shared the sandwich of the day at the Wine Depot & Deli, where our thirst was quenched only by lemonade. Let me repeat, only lemonade. Which doesn’t explain how I managed to walk back to the car and drive for four hours before realizing that I had left my Nikon DSLR behind. It was with little hope that I tracked down a phone number for the café, but we were in luck. My camera was found hanging on a restaurant chair, and it was delivered via UPS before we arrived in California. Flooding used to be a problem in Albany, GA. Located on the banks of Flint River, riverfront properties were vulnerable when rising waters crested as high as 35 feet in a bad year. Turning misfortune to good use, the good citizens of this Albany eliminated commercial and residential use of the riverfront in favor of parks. 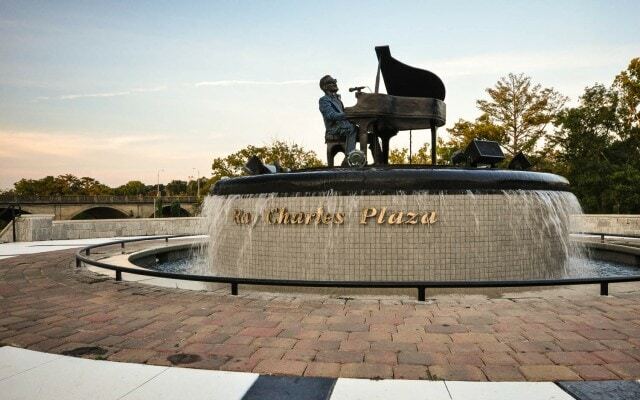 Encompassing 6-acres, Riverfront Park is home to the Albany Welcome Center, the Turtle Grove Play Park, and a 1.5 mile Greenways Trail that leads to Flint Riverquarium and the Ray Charles Plaza, paying tribute to the native-born legendary blues singer. When we visited the Ray Charles Memorial in August 2011, the sun was past casting that golden glow preceding sunset. And yet the fountain’s flowing waters seemed to sparkle and shimmer, as if in response to such classics as Georgia On My Mind filtering from discreet loudspeakers. Students from Georgia Academy for the Blind helped with the design, including adding a touchable miniature version of the life-sized statue that feature markings in braille. If only the Riverfront BBQ were open on Sundays, we would have followed our walk in the park with what I’m told are fall-off-the-bone ribs. Alas, it was not so we ended our visit by driving to The Catch for shrimp and grits. If there’s one thing to learn in this Albany it’s that there’s always a silver lining. It’s a funny thing to walk in another Albany; I can’t help but wonder what if that was my Albany? How would our lives be different in another Albany? Then, again, that’s true wherever we travel. Every time I take my children to another place, it’s an opportunity to learn about the people and choices that make that place, and it’s a chance to imagine who we might be in that world. That’s why, even though we’re based in Albany, NY, Albany Kid is about enriching family travel wherever the journey leads. Albany IS a state of mind. This is really interesting…I never knew there were so many other Albany’s, or the origin of the name. I think I’ve been to Albany, GA once, many moons ago. But ours is definitely best! Most definitely, although I’d love to visit all the places named Albany, just to compare of course! 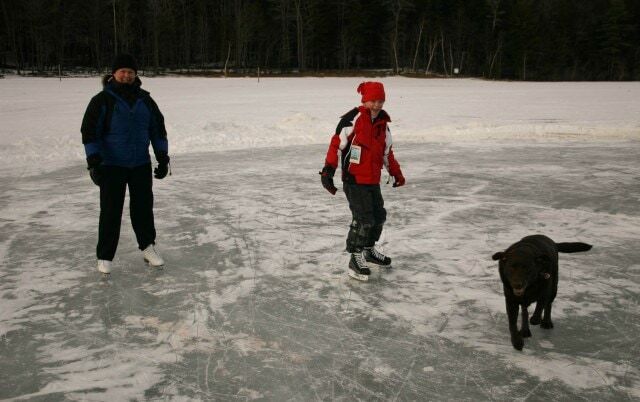 Sandra Foyt recently posted..What Makes Keystone a Great Family Ski Resort?